The current Honey Bee Stamps Buzzworthy challenge is to create a card using one of their Honey Cuts dies as the focal point. I love the Smile die, so this was a perfect challenge to show it off. 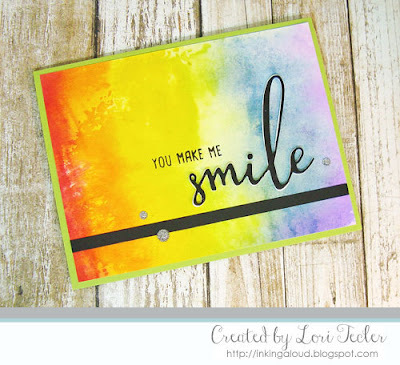 I used distress inks and water to make a rainbow-like background panel on watercolor paper. While the inks dried, I die cut the word from both black cardstock and craft foam. After layering the two pieces for dimension, I adhered them to the rainbow panel. To complete the sentiment, I stamped the "you make me" from the coordinating Smile stamp set just above the word in black ink. A narrow strip of black cardstock was adhered just beneath the text and accented with a trio of silver glitter enamel dots. The finished panel was adhered to a green card base, matching the middle color in the rainbow panel. Love this card Lori! That rainbow backgound and that huge sentiment are fantastic!